This workshop is for the intermediate-advanced orthosis fabricator (splinter) (OT, PT, CHT) who is already fabricating dynamic/mobilization orthoses (splints). 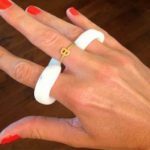 Learn quick and effective, cost-saving tricks including how to combine dynamic and static-progressive components on one orthosis (splint) OR how to combine flexion and extension on one orthosis (splint)! 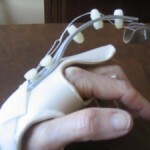 Make an orthosis (splint) with the cobra/clikstrip system. Play with several different thermoplastics and thermotubes. 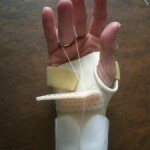 Get out of your orthotic fabrication(splinting) rut with this workshop! Have hours of fabrication time with the chance for you to direct your learning experience! 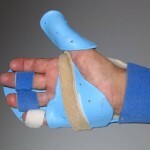 Variations of the orthoses (splints) listed below will be available as directed by the group! The maximum class size is 6. This workshop is for the beginner-intermediate level orthosis fabricator (splinter) who would like to improve their static/immobilization orthosis fabrication (splinting) skills, and increase their knowledge of clinical application. The small and relaxed lab environment of this course allows novice therapists to reduce their fears of fabrication and increase their confidence in making patterns and handling materials. 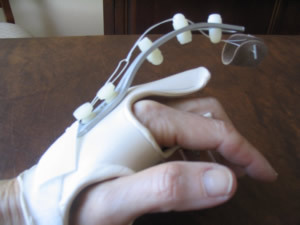 This workshop is for the beginner-intermediate level orthosis fabricator (splinter) who would like to learn to use outriggers and improve their static-progressive and dynamic/mobilization orthosis fabrication (splinting) skills. This workshop provides a safe and fun environment to try out new materials and outriggers, as well as new static-progressive/mobilization components. Opportunity for clinical problem-solving will be provided. This workshop is for the intermediate-advanced orthosis fabricator(splinter) who would like to improve their dynamic/static-progressive/mobilization orthosis fabrication (splinting) skills, their clinical reasoning and their knowledge of new thermoplastics, designs and components. The opportunity to problem-solve and share “tricks” will be provided. Participants will fabricate a variety of orthoses utilizing new components, and Thermotubes within a highly intensive but relaxed teaching environment. Get out of the same “rut” and learn some new techniques and clinical applications. Learn cost-saving and time saving tricks. This workshop is designed for your specific level of orthosis fabrication (splinting) and allows you to control the learning experience. 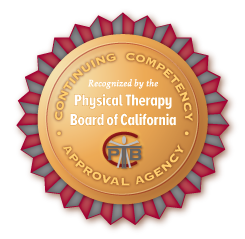 The course is for one or more therapists who want their own private course. The course content and the date is determined by the participant(s). The course content is not limited to the courses already offered by the instructor. The course venue is in Carlsbad (northern San Diego) or at the participants facility. © 2019 Upper Extremity (UE) Seminars.